Pies are beautiful. They are a work of art. Each one is different, unique, a creation. My mom tells stories of learning how to bake with Grandma Dora, her mother-in-law. She remembers a time when they decided to bake a pie together. She volunteered for the easy part, cutting up the fruit for the inside. She decided to let Grandma take charge of what she did best, the crust. Grandma Dora tossed in a few ingredients, her hands flew and moments later, a beautiful crust just appeared. My mom said it was incredible to watch. Grandma was a true master of the art of pie making. After hearing this story, I decided I had to try the pie crust recipe that I found when I was looking through Grandma’s recipe box. It came from her friend, Pearl Curtis. I knew it had to be good because I found two copies of it. One that she had written on a scrap piece of paper and the other that she had written out on a recipe card to save, though she had saved both. 1/3 cup flour and salt mixture and mix with 1/4 cup water. Cut into remaining flour, 2/3 cup shortening. The old and the new. Grandma Dora’s pastry cutter and my Kitchenaid. 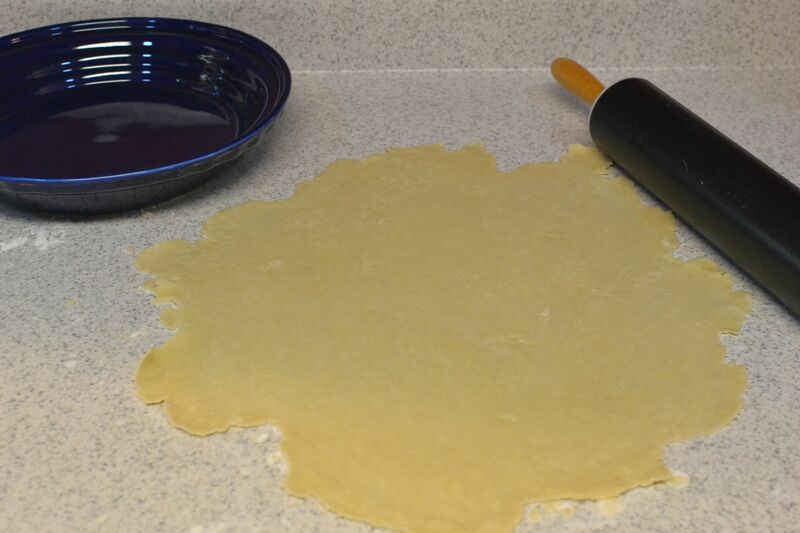 As I was getting out the ingredients and supplies to start putting the dough together, I got out my pastry cutter, which just happens to be Grandma Dora’s. Then I remembered a tip from my sister Amy. Always use the Kitchenaid to mix up your pie dough. It’s so much easier! I felt kind of guilty, making a pie crust in the Kitchenaid, with my Grandma’s pastry cutter sitting there on the counter, but if she were still alive, I’m sure she’d be making it that way too! I started out by measuring the flour and salt into the Kitchenaid bowl. I mixed it together and then pulled out 1/3 cup and put it into a small bowl. I added 1/4 cup of water to the bowl and set it aside. Then I measured out 2/3 cups of shortening and cut it into the flour mixture that was left in the Kitchenaid bowl. 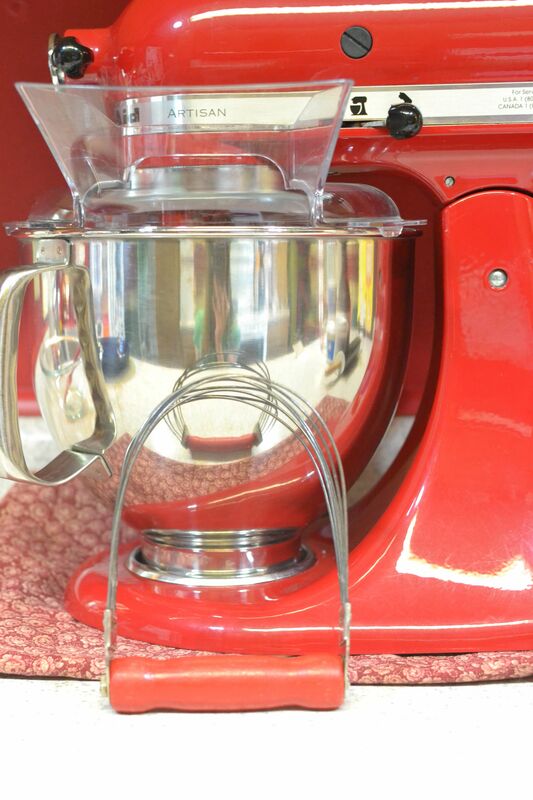 After that was complete, I combined the mixtures into the Kitchenaid and turned it on. I found that the 1/4 cup of water wasn’t enough. The dough was still quite dry. So, I slowly added more, a little at a time, until it was a good consistency. I ended up adding quite a bit more water, probably 4-5 Tablespoons, till I was able to form it into a ball with my hands and it held together. Once it was in a ball, I divided it in half. While the recipe doesn’t say it, it’s enough dough for two crusts. One top and a bottom or two bottoms. The pie that I was making didn’t require a top crust, so I wrapped one of the two balls of dough in saran wrap and put it in the fridge for a different pie on a different day. Then I started the process of rolling out the dough that I had left out. I’m a bit of a perfectionist, so pie crusts are difficult for me. (Deep breath!) I want them to look like a magazine cover or what you see in a bakery, uniform and perfect. But I needed to remind myself that each homemade pie should look unique. That’s the beauty of it and the difference in each one is what makes it special. Once I was finished, I pricked the crust with a fork so it wouldn’t bubble up and popped it into the oven at 425 degrees for about 10 minutes, until I started to see some browning around the edges. Because the pie recipe I was making had a filling that needed to be added to a baked crust, I had to bake it first. 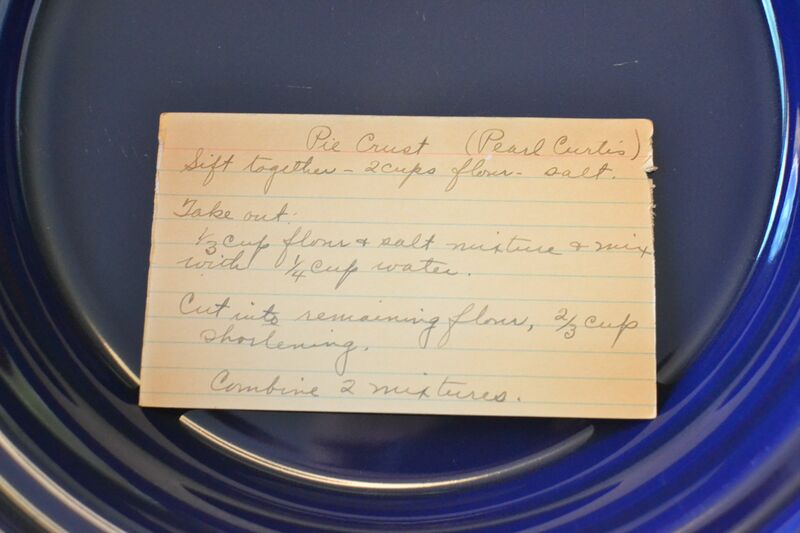 Other recipes, for fruit pies with a top and bottom crust, wouldn’t be baked until they were all put together. Combine flour and salt. 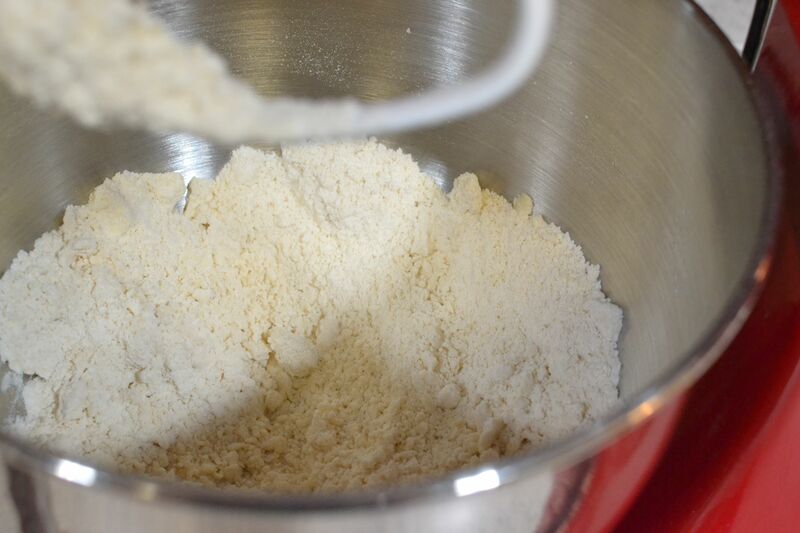 Remove 1/3 cup of the flour/salt mixture and combine with water in a small bowl. Set aside. Cut shortening into the remaining flour/salt mixture in Kitchenaid. Combine two mixtures. 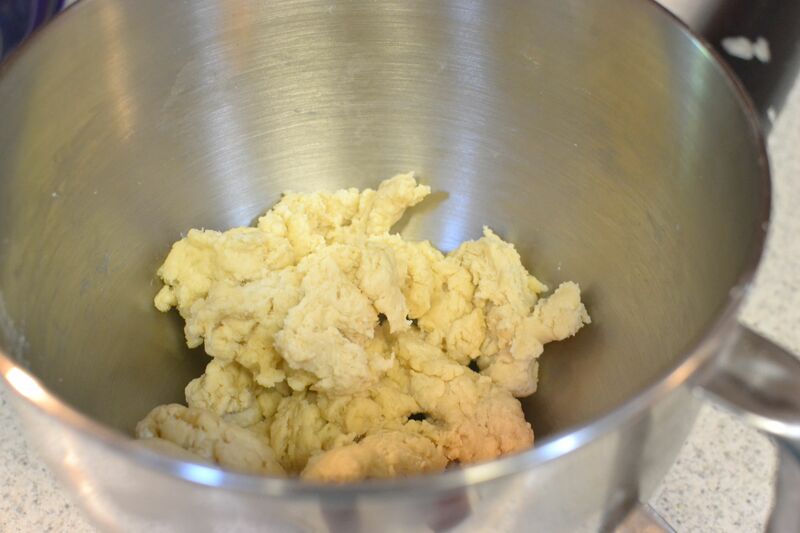 Add more cold water if necessary, till dough forms a ball in your hands, that stays together. Divide dough in half. 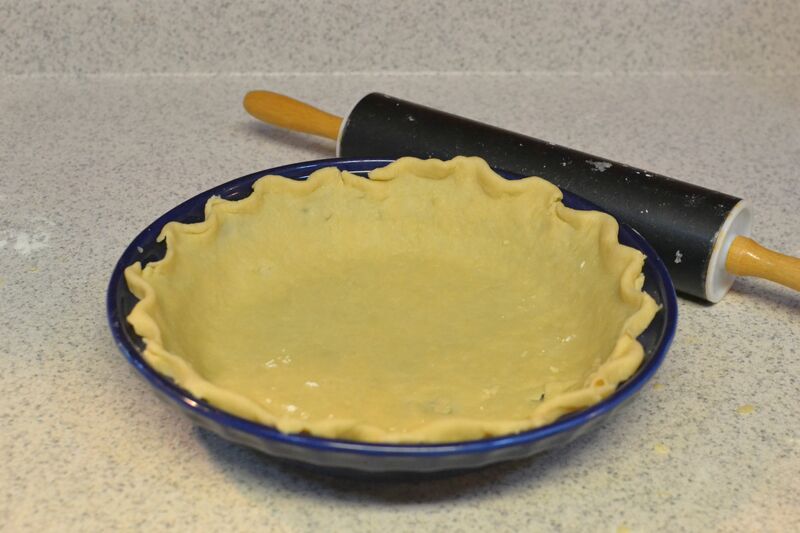 Roll dough out thin, big enough to lay over the top edge of pie dish with enough extra to pinch top edges. Prick with fork. Bake at 425 degrees for 10 minutes or until edges are just beginning to brown. Cool and fill with pie filling of your choice. 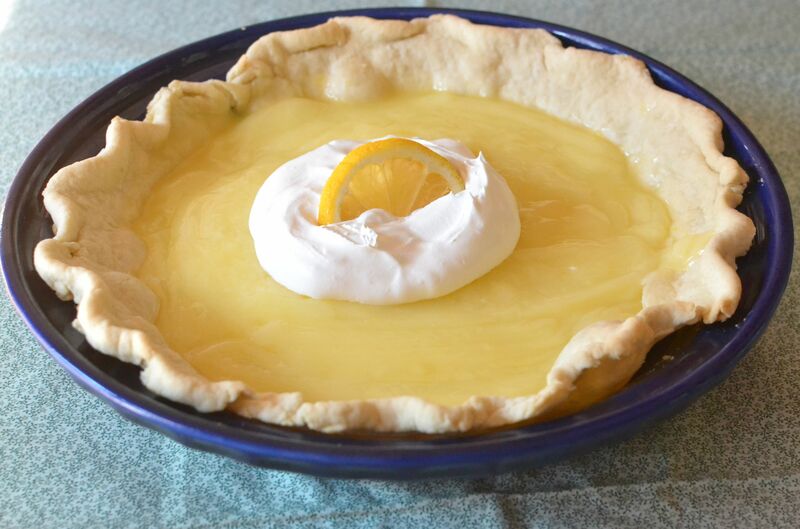 This entry was posted in Pie Crust, Pies and tagged baking, farm cooking, grandma's cooking, homemade, Kitchenaid, Pastry, Pastry Cutter, Pie, Pie Crust, scratch cooking, Summer dessert by GrandmothersRecipeBox. Bookmark the permalink. It was delicious! I’ll be putting the recipe up for it soon!